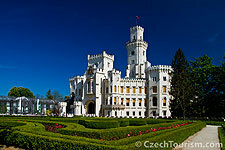 We offer tours and transfers for landmarks, attractions and beauties of Czech Republic and EU. Below you will find the offer trips. Do not hesitate to contact us by e-mail us at info@transport-airport-prague.com or calling (+420) 721 099 333. Brno – The second largest city in the Czech Republic, Brno is an important industrial and business centre, thanks particularly to the brno Exhibition Centre which hosts a number of significant international shows and exhibitions annualy. The St. Peter and Paul Cathedral is the bishop's seat and forms part of the city's charming panorama. Spilberk , a royal castle from the 13th century, also enriches the city's panorama. More..
Český Krumlov - Whole generations of visitors to South Bohemia region agree on one thing: it is an area to which everybody loves to return. The region offers monuments and natural beauty, everything that makes for a pleasant holiday – both in summer and in winter. In South Bohemia there are more than 15,000 works of architecture, especially castles, chateau, monasteries and towns of immense artistic and historical value. Cesky Krumlov - this UNESCO listed town is considered to be the best-preserved Renaissance town in Central Europe. The well-preserved medieval houses of its ancient town core lie on one bank of the Vltava river, while its magnificent castle, the second biggest after Prague's, dominates the other. History names this castle for the first time in More..
České Budějovice - City of Budejovice was established in 1265 by Czech King Premysl Otakar II. Two rivers merge together here - Vltava and Malse. This short walk will take us to historic center of Ceske Budejovice which was in 1980 registered as Protected City Area. Delicious beer has been brewed in Ceske Budejovice since 1265 when king Premysl Otakar II granted the city certain privileges including right to brew beer. Budvar Brewery was established in 1895 as the first Czech brewery whose stock could be publicly traded and on October 7th of the same year the first brew was made More..
Hluboká Chateau - this beautiful neo-Gothic chateau in the Tudor style overlooks the Vltava river, and was founded in the 13th century. It houses rich collections of tapestries, woodcarvings, china, pictures and old weapons. A large English park surrounds it. More..
Plzeň The Royal Town of Pilsen was built by King Wenceslaus II in 1295. 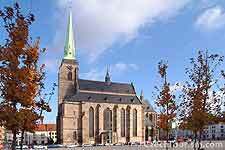 Nowadays is the West Bohemian metropolis of Pilsen the fourth biggest town in Czech republic. The historical heart of the city was proclaimed the urban preserved area. Plzen is the place where golden lager beer was born in 1842, since when the whole beer world has been trying to imitate it. Beers bearing names such as "pils", "pilsner" or "pilsener" number in the hundreds; however, the only original recognized worldwide is Pilsner Urquell. In the Pilsner Urquell Beer World you will discover the secret of this original and will become acquainted with the renowned Czech art - that of brewing good beer. More..
Mariánské Lázně – the great West Bohemian spa, an urban historical zone loved for its poetic atmosphere, located at Kladska protected nature reserve, baths with 40 mineral springs right in the city, museum, Singing fountain. In the Marianske Lazne are treated a wide range of diseases due to the composition of the springs, which is chemically very different. More..
Karlovy Vary - The most famous West Bohemian spa town of Karlovy Vary was founded by the Bohemian King Charles IV in the 14th century. You can taste the water from the 12 curative thermal mineral springs, admire the beauty of both the historic and modern colonnades, and purchase some of the typical souvenirs such as special wafers, Moser porcelain and glass, or the Becherovka liqueur, also known as the 13th curative spring of Karlovy Vary. The Karlovy Vary spa is known for treatment of diseases of the digestive tract and metabolic and endocrinal disorders. More..
Konopiště The romantic Konopiste Chateau is located 40 kilometres (27 miles) south of Prague. The Chateau was built in the late 13th century in the style of a French Fortress. The last private owner Archduke Franz Ferdinand d' Este, the successor to the Austrian throne, was assassinated in Sarajevo in 1914. The chateau situated in a lovely park contains extensive collections of historical weapons, furnishings, late-Gothic Sculptures, paintings, rare tapestries and innumerable hunting trophies. More..
Kutná Hora - was designated a UNESCO World Heritage Site thanks to the quantity and quality of its historical monuments. Because of its rich silver mines, Kutna Hora became the second most important town of medieval Bohemia. The richness of the city resulted in beautiful architecture and construction of several astonishing monuments such as Italian Court and St Barbara' s Cathedral. An other very interesting place is the Ossuary in Kutna Hora-Sedlec. 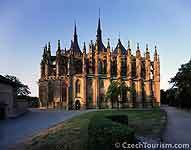 The small Christian chapel of Ossuary is located beneath the Church of All Saints in Sedlec, a suburb of Kutna Hora. The ossuary of the "Bone Church," as it is popularly known, contains approximately 40,000 human skeletons which have been artistically arranged to form decorations and furnishings for the chapel. More..
Liberec The Liberec region is home to the Protected Landscape Areas of the Jizera and Luzice Mountains and the Krkonose Mountain National Park located in the north of the Czech Republic on the border with Germany and Poland. It is an area with a rich history and a wealth of natural, cultural, and historic landmarks, an area that is rightly known as heaven on earth for tourists, skiers, lovers of nature, and history enthusiasts. Liberec offers many interesting buildings of different architectonic styles. From modern architecture you can see the dominant of Liberec - an original construction in the shape of a rotating hyperboloid built on the top of the Jested hill in the height of 1012m. 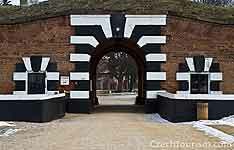 More..
Terezín - was established at the end of the 18th century as a fortress. Still surrounded by its massive ramparts, the town lies at the confluence of the rivers Labe and Ohre. The Main and Lesser Fortresses at Terezin, although modern for their period, gradually became obsolete, and having lost their military function fell into disregard. Only in the relatively recent past has Terezin once again entered the world' s public consciousness as a tragic symbol of the sufferings of the tens of thousands of innocent people who died here during the Nazi occupation of their homeland. More..
Slavkov chateau and the area where the biggest battle of Napoleon Wars took place – „Battle of 3 Emperors“, and the Monument of the battle at Prace. Slavkov chateau – built in the Baroque style in 1700, this chateau houses paintings, a library and mementoes of the Napoleon wars. 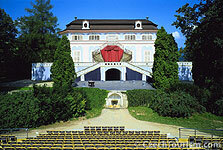 More..
Telč The Town of Telc is located in the segmented and wooded area of Jihlava hills. Place is surrounded by ponds and gates and it managed to keep its unique look from the times of its founder and at the same times the personality of owner builder of Renaissance Telc - Lord Zachary of Hradec. Historic center of the Telc, thanks to exceptional preservation and sheer number of its historic sights was in 1992 placed on the list of UNESCO World Heritage Sites. Town is dominated by chateau, at its ground level are well-preserved couple of uniquely decorated spaces – rooms with rich and decorative and figural sgraffito adornments. There is also Chapel of All Saints. Richly decorated Renaissance interiors of the chateau together with living quarters of the last owners – More..
Litomyšl In this day we will visit Litomysl – a site world-famous with Bedrich Smetana family home and Bedrich Smetana Litomysl Music Festival. We will visit the originally a renaissance castle of the Italian type which was very popular in 18th century Central Europe. Farm buildings surrounding the castle are mostly built in the baroque style. 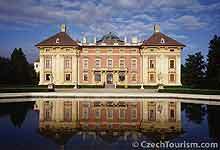 History lovers and art connoisseurs will surely be tempted to see this jewel of Czech Renaissance architecture, historical town preserve and chateau in Litomysl which has been listed in the UNESCO inventory of protected monuments since 1996. 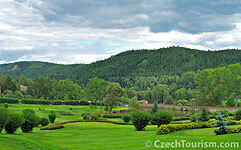 More..
Moravský kras – the area of ravines and stalagmite caves is a popular tourist spot. The best-known and the most impressive formations are the Macocha abyss and the Macocha cave, a labyrinth of underground passages created by the river Punkva. 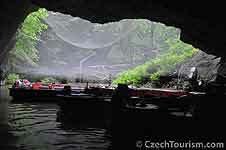 Enjoy the Punkva river cruise and cableway to lookout of Macocha abyss. More..
Kroměříž – a town extremely rich in historical monuments. Kromeriz is situated in the fertile Hana lowlands. The town was founded in the 11th century. 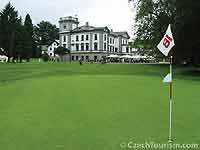 The most outstanding building is the large Baroque chateau, built on the site of an earlier Gothic castle. Kromeriz chateau has the rich interior equipment – main rooms, congress hall, where the Austrian Constituent Assembly was held in 1848, Seigniorial hall, library and archepiscopal picture gallery, chateau garden and Italian flower garden. More..
Karlštejn The 14th century Karlstejn Castle is a historical site, where the crown jewels and personal relics of Charles IV, the Holy Roman Emperor, are stored. 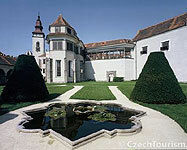 The castle, surrounded by a beautiful romantic countryside, belongs among the most visited castles in the Czech Republic. More.. Try tours of Prague with our long-term contractual partner.